DocuFreezer - Convert PDF to JPG, XPS to PDF, TIFF to JPG, HTML to PDF, etc. Batch convert files with DocuFreezer in three easy steps! 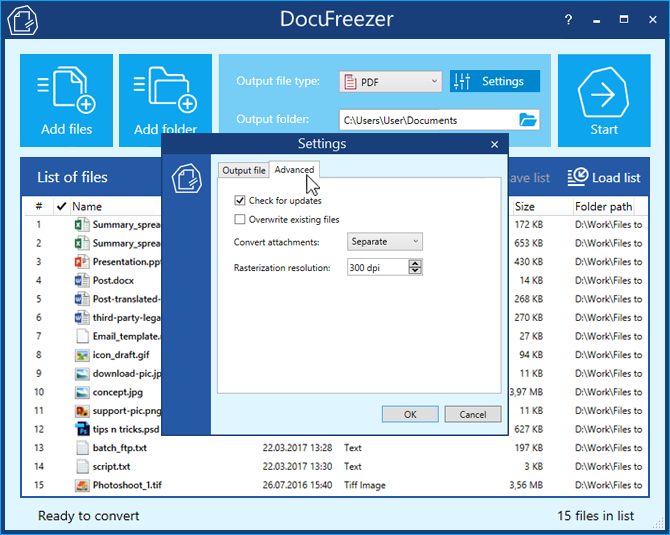 DocuFreezer is a desktop application which converts your documents and images to PDF, TXT, JPG, TIFF or PNG formats “freezing” the look of the input documents and protecting them from any amendments. No matter which device the document will be displayed on, it will look exactly the same as the original. Converting an Adobe PDF document, Word document, Excel spreadsheet, Outlook e-mail, PowerPoint presentation, HTML page, Photoshop image file, XPS file, text file or JPEG image to another format is usually not a problem. But what if you need to batch convert many files and don't want to repeat the same operations over and over again? Free file converter DocuFreezer can save your time every day. The program interface is very simple: drag-and-drop your files, select output format and click "Start". DocuFreezer keeps it simple - the program is not crammed with numerous settings and options. You can add several files, entire folders or RAR, ZIP and 7ZIP archives with documents directly on the main window. 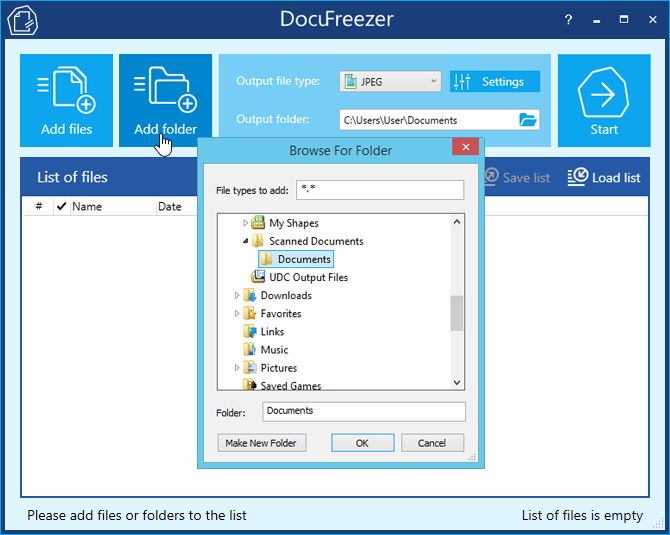 DocuFreezer helps you easily convert your files and protect them from being modified. After conversion, the output files will keep the original files’ structure, page layout, text formatting, fonts, and hyperlinks. DocuFreezer also preserves the color attributes of original files. 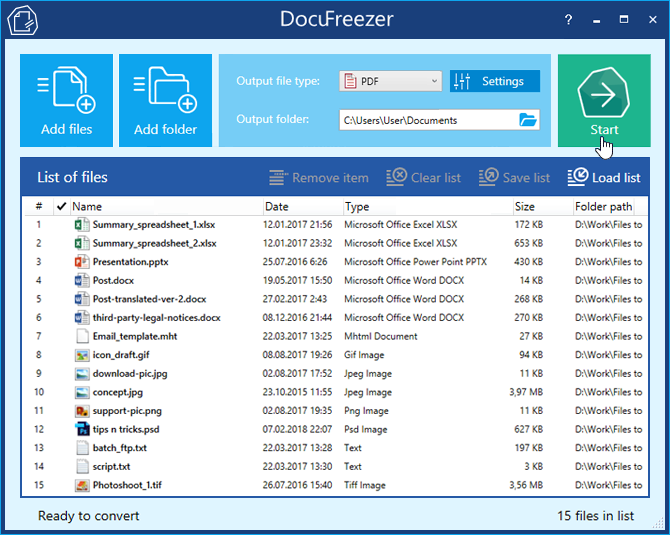 If you need to archive documents, save them as a backup, or if you want to provide a non-editable copy for others, DocuFreezer will help you convert almost any document to PDF, JPG, TXT. This will let you have your files accessible on any modern device, keep them safe and open several years later. 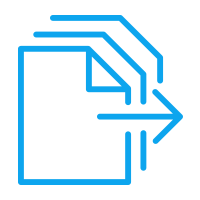 DocuFreezer software is designed to batch process documents and images quickly and automatically via a drag-and-drop interface. Add dozens or even hundreds of documents to the list and have them converted in one go without any user attention. You no longer need to open each file and convert it by yourself! 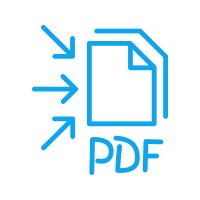 DocuFreezer supports over 70 input file extensions (and the number is growing!) including all popular types of documents and images such as Adobe PDF files (.PDF), Microsoft Word documents (.DOC, .DOCX), Microsoft Excel worksheets (.XLS, .XLSX), Microsoft PowerPoint presentations (.PPT, .PPTX), plain and rich text files (.TXT, .RTF), XPS files (.XPS, .OXPS), AutoCAD files (.DWG, .DXF), and more. With DocuFreezer, you can add several PDFs to combine and merge them into one single document, e.g. to make a multipage PDF from JPG images. Or split a large PDF - extract all pages to many single page files. Moreover, you can add new files to existing PDF e.g. add a cover page to the beginning or an additional page to the end of the document. Merge and split options are available for PDF and TIFF. 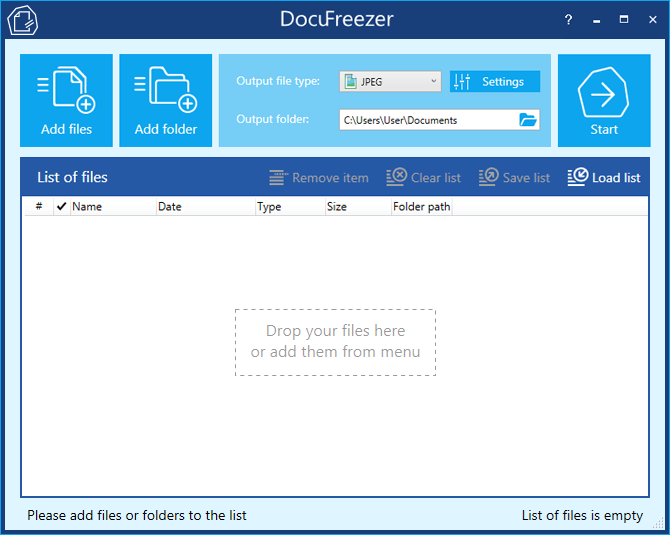 Download DocuFreezer to automate your file conversion. DocuFreezer is free for non-commercial purposes! Convert multiple files at once: PDF to JPG, Word to PDF, TIFF to JPG, HTML to PDF, etc. Most programs, such as Microsoft Word, OpenOffice, Excel, PowerPoint, and Adobe Acrobat, make it possible to export documents to the PDF format without the necessity to install any third party applications. This is convenient when there are just a few documents to process. Still, when there are dozens of them to be converted, the task becomes pretty tedious: you will need to handle each document individually. Opening each file, saving it as a PDF file, closing the document, and then repeating the same steps with the next file can be very time-consuming. 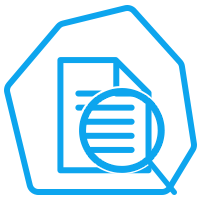 DocuFreezer is designed specifically for processing a large number of documents or images that need to be changed to other formats. Try our software and see how much time you can save! DocuFreezer 3.0 – OCR Your Images & Scans to Text and Get Better Performance- The new DocuFreezer 3.0 can now OCR your scanned documents and images! It also has TXT as a new output file type and higher file processing speed. The program was overhauled and got some other improvements and fixes as well. 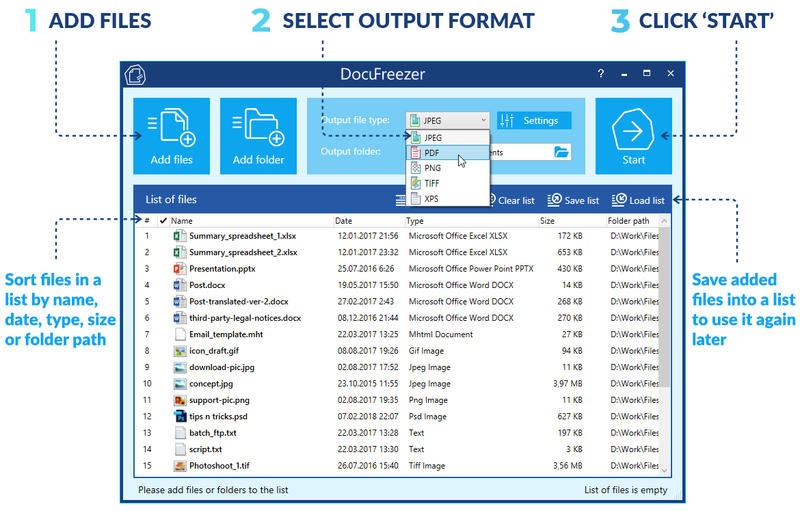 Combine, Merge or Split PDF & TIFF Files with DocuFreezer 2.0- Combine, Merge or Split PDF & TIFF, combine PDF files into one, convert PDF Portfolio to single PDF, convert Word documents to PDF, convert email attachments to PDF and more with the new DocuFreezer 2.0! How to Automate Text Documents Processing with Microsoft Word API- Most of the text documents are created by Microsoft Word. This program allows automatic document editing, printing, as well as exporting text files to PDF via Microsoft Word API. 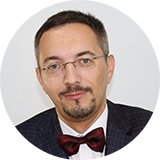 Learn how to automate the following tasks: printing of text documents and converting them to PDF. 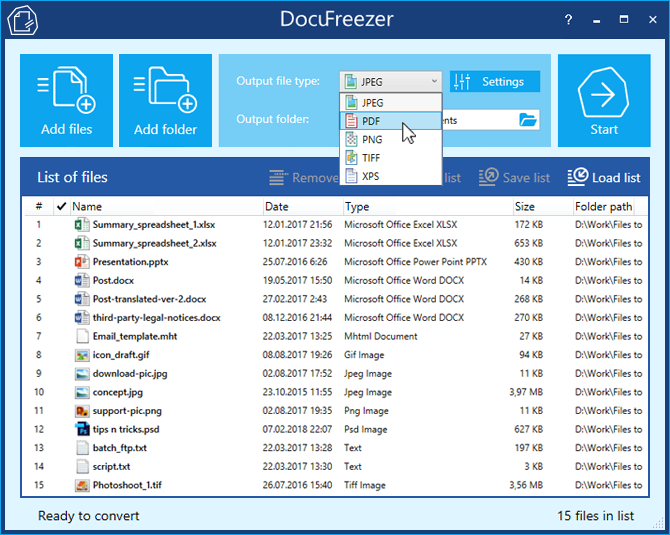 Convert Outlook Messages to PDF using DocuFreezer 1.5!- DocuFreezer deals with a wide variety of formats – common and not so common ones. 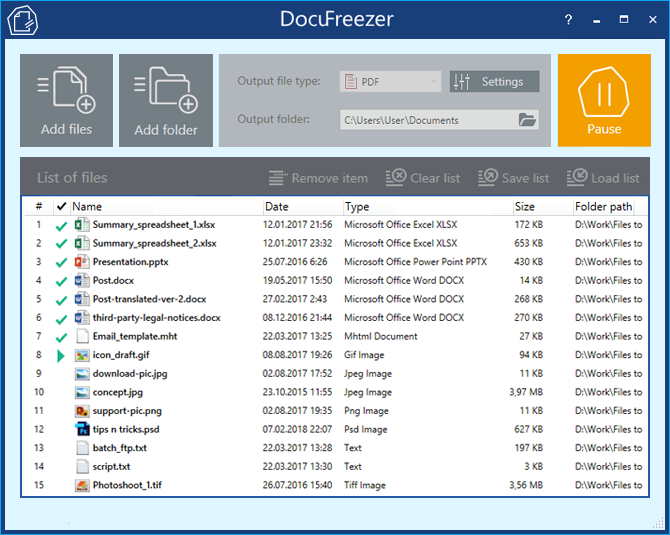 The latest version of DocuFreezer can process Microsoft Outlook MSG files with attachments and is equipped with an improved component for converting Microsoft Word documents to PDF format and to image files. DocuFreezer 1.4 is Ready to Create PDF from OpenOffice and PostScript Files!- DocuFreezer version 1.4 has been updated with newly added formats: OpenOffice ODT, ODF, ODP, ODS and ODG documents, PostScript (*.PS), Encapsulated Postscript Vector graphics (*.EPS) files and SVG image files. 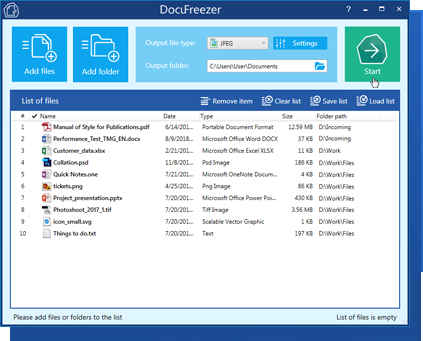 Free version of DocuFreezer is available for personal and non-commercial use. Also, the free version may be used for evaluation purposes. Commercial license is required if you need DocuFreezer for business needs. 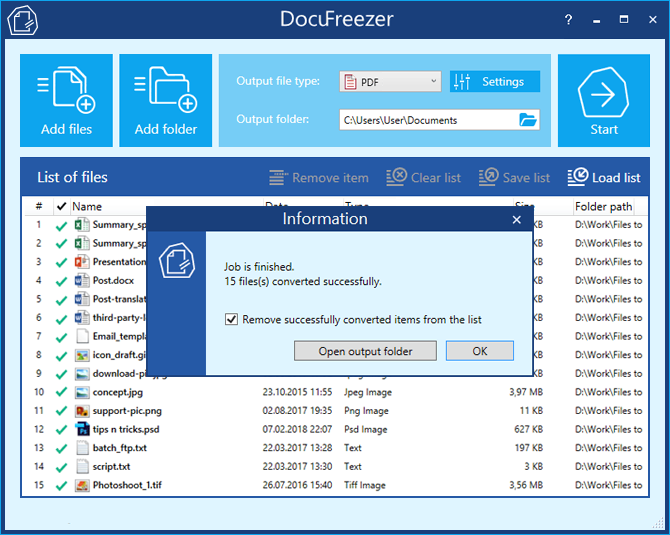 Commercial version costs $49 and allows customers to install and use DocuFreezer under one Windows user account. If you purchase 5 or more licenses, you will get a discount. We've designed DocuFreezer to let you save time on dull and time-consuming tasks so that your team members can focus on what's really important.